Terrible news for football, we just learned via 20Minutes that the plane carrying the player Emiliano Sala and a passenger for Cardiff disappeared from the radar. btw @IamFrench big fan of your work, long time admirer. I live in Channel Islands and the amount of search & rescue planes that were flying around late last night was very unusual. Will cardiff get their money back? Sorry but i am just wondering. Exactly.... like that Italian chap last from fiorentina was it? He's going for MAX BIN at 50k this morning..
It’s tragic that coins go before morals with certain players. Just shows how disgusting some ppl are. Happens every time, recent year the lad from Bolton know his name just can’t spell it. Fiorentina, even Adam Johnson ffs. People I don’t get are the buyers, why. I can’t fathom it. Inflated prices could also be fans wanting his card before it is removed from the game. Also scum. 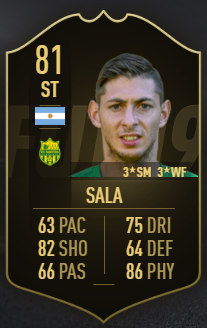 No disrespect to Sala, but nobody is going to use him in their team. Yeah, I wish this thread would be removed off the this forum page. Hope he and and any others onboard are found safe. Shame on anyone trading on this. 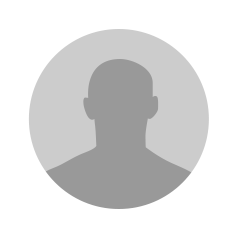 Fabrice Muamba. Remember that, was at the game when it happened. Really nice chap too, gave me his shirt after an FA cup QF at Brum. But people are utter gimps. Unfortunate fact of life. They will stop at nothing to profit, even in virtual terms, which is quite frankly, pathetic. It goes without saying that this is extremely worrying news and I hope that anyone involved is found safe and well. I understand the concerns about the item price, it's something we will review. Finally - lets not have this thread turn into a place to post insensitive jokes. They will not be tolerated anywhere on the forum and will likely result in a suspension from the forum regardless of previous moderation history.